These are the guiding principles behind Rampton Stonescapes’ commitment to excellence. At Rampton Stonescapes we understand the value of your investment and the quality you hope for. Using only premium building materials while fusing modern equipment and techniques with a centuries old craftsmanship, every project is completed in the highest quality that will stand the test of time. Each project meets or exceeds ICPI and NCMA standards ensuring quality workmanship that Rampton Stonescapes and customer alike are proud of. This pursuit for quality has brought Rampton Stonescapes recognition as the winner of Keystone Worldwide Calendar contest (2009) and our work is featured throughout Abbotsford Concrete Products promotional material. At Rampton Stonescapes, “good enough” will never do! Quality is assured in each and every project and we work hard to be the very best at what we do. 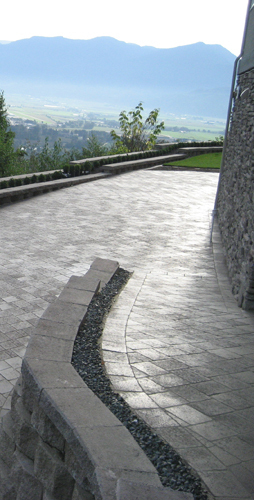 Through the years Rampton Stonescapes has earned the trust and confidence of its clients. With an untarnished reputation and an impressive list of achievements, it is no wonder that many of our clients refer us to their friends and neighbors. Leading the industry in stonescape and stonework landscaping, our commitment to excellence is visible in our finished work, our crews, and in every aspect of Rampton Stonescapes. Standing 100% behind all of our workmanship, we strive to treat each customer, home, and property with respect and care. Rampton Stonescapes supports and is involved in local charities, we ensure fair wages and good work conditions for our entire crew, and we maintain a “non-smoking” policy for our crew to ensure the health and comfort of our staff and clients. Rampton Stonescapes holds full liability insurance coverage, is in current and good standing with WBC, is certified by ICPI, AquaPave, NCMA, and will always arrive at the jobsite in clean trucks with proper Rampton Stonescapes signage. Our integrity is our business. Our portfolio speaks for itself and we look at each project as an opportunity to reinvent ourselves. Thinking out of the box in design and application coupled with hard work and determination has been the catalyst towards many awe inspiring projects that you and your neighbors won’t stop talking about. Taking great pride in each project, we come alongside the customer’s vision transforming an idea into reality. Open to new ideas and concepts, at Rampton Stonescapes we love to challenge the status quo of stonework landscaping pursuing fresh and unique concepts sure to inspire every customer! We are highly skilled and experienced in every form of stonework and our end product is the proof. We promise to pursue your vision relentlessly while lending our skill and experience to the process of creating a stonescape unique to you. The awards and recognitions we have received throughout the years are living testament to our pledge of providing only the best and the finest results for each and every project. View our collection of awards and achievements. Coming soon!